Assigned status Up to Date on April 2, 2015. Because the eye is a superficial fluid filled structure, ultrasound is an easy to use modality for visualization of ocular pathology and anatomy . The principles of ocular ultrasound are the same as other applications of this technology. Sound waves are generated at a frequency greater than 20,000 Hz (20 kHz), and reflected back to the transducer by tissue in its path. When the sound wave returns, a piezo-electric crystal in the transducer vibrates, resulting in electrical impulses that are translated into an image or other data . Higher frequency waves penetrate less into tissue but have better resolution. In contrast, lower frequency waves penetrate more deeply but have worse resolution. Ultrasound waves, like other waves, have predictive behaviors based on properties of the medium they travel through. For instance, sound waves have higher velocity when traveling through solids than through liquids . When sound waves travel between tissue interfaces with different acoustic impedance, or densities, they can either scatter, reflect, or refract. Some sound is absorbed by tissue as well. Sound waves that return to the transducer are called echoes, and ultrasound imaging zones can be hyperechoic, hypoechoic, or anechoic. Shadowing can occur distal to a very dense lesion, resulting in an anechoic region. The most prevalent use of ocular ultrasonography is to obtain globe length in order to calculate corrective lens power requirements. Other uses include the measurement of tumors including choroidal melanomas , visualization of lens dislocation , and detection of retinal detachment. Ultrasonography is especially useful in cases in which the fundus is obscured from visualization by slit lamp and laser interferometry (IOL Master), as in patients with dense cataracts . In this population, the use of ocular ultrasonography may result in earlier detection of ocular melanoma . The benefits of ultrasound include improved visualization of structures obscured by opaque substances,such as dense cataracts or vitreous hemorrhage. Second, real time information is available to the practitioner regarding conditions such as retinal detachment. Finally, ultrasound is safe, does not expose the patient to radiation, is widely accessible, and is low cost. Disadvantages include a high level of inter-operator variability , which does not plague other forms of imaging including optical coherence tomography, CT, and MRI. A-scan, or amplitude scan, is one method used for ocular assessment via ultrasound. The tear film is an adequate agent for acoustic transmission, thus absolving the need for ultrasound coupling jelly . In A-scan, a single sound beam is sent from the transducer . Echoes that return to the transducer are converted into a series of spikes with height proportional to the strength of the echo . The strength of the echo depends on several factors. The first is the properties of the two tissues at an interface. If the interfaces are very different, the echo will be of higher amplitude resulting in a taller spike. If the interfaces are similar, the spike will be short. Spike height is also impacted by the angle of the sound wave hitting the interface. When the transducer is held such that the angle of incidence is higher, some echoes will not return to the transducer. As a result, the spike height is lower. As can be imagined, other factors impact how well the sound wave returns to the transducer such as the smoothness or regularity of the interface and the density of the structure through which the sound passes. Denser objects absorb more energy, thus retinal spike height decreases when dense cataracts are present to impede signal return to the transducer . Measurements derived from the A-scan include spike height, regularity, reflectivity, and sound attenuation. A-scan has the ability to characterize internal tumor structure and composition based on the aforementioned data. Furthermore, vascular pulsations can be visualized as small oscillations of a spiking pattern, which are useful to note in cases of choroidal lesions such as melanoma . Eye length in the axial dimension can also be obtained by measuring the distance between specific spikes. Interpretation of A-Scans is summarized in the table below. 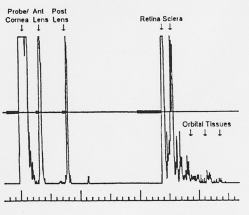 The first spike, which is always the tallest, represents where the probe interface meets the cornea . There are then two spikes separated by a short distance, representing the anterior and posterior lens. After these spikes, there is usually a flat line representing the vitreous. When a retinal or vitreous detachment occurs, extra spikes appear in this flat region, with variable amplitudes depending on the lesion. Retinal detachment results in a high amplitude spike, whereas vitreous detachment results in a low amplitude spike. Choroid detachment, in contrast, produces a high amplitude spike with double peaks. Distal to the flat vitreous region, a series of spikes that progressively decrease in amplitude are normally seen. These represent the retina, sclera, and orbital tissues such as fat, in order. The gain, or input sensitivity, of an A-scan alters the size of the resultant spikes. A proper balance is required when selecting gain as weak signals or smaller lesions are more visible when the gain is high, but noise increases as well, thereby reducing resolution. It is recommended to begin with high gain to detect small lesions, and then to reduce the gain to improve sharpness of the image. B-scan, or brightness scan, is another method used for ocular assessment via ultrasound. It can be performed directly on the anesthetized eye. In cases of trauma or in children, B-scan can be performed over the eyelid with coupling jelly. Measurements derived from B-scan include visualization of the lesion, including anatomic location, shape, borders, and size. It can be used for a detection of a wide-range of pathological structures, including retinal or choroidal detachment, foreign bodies, calcium, and tumors . Echoes in B-scan are converted to dots with brightness intensity that is proportional to the echo amplitude. For example, high amplitude echoes appear as hyperechoic (white), and absent echoes appear black (anechoic). It is especially useful in imaging of tumors of the anterior orbit, myositis with associated EOM tendon thickening, and visualization of the superior ophthalmic vein in carotid cavernous fistulas . Similar to A-scan, high gain results in good sensitivity, but poor resolution. It is essential that lesions are centered in the image to obtain the best quality possible. Retinal detachment is an ophthalmologic emergency that can result in severe loss of vision. A variety of etiologies exist for this condition, including proliferative diabetic retinopathy, penetrating trauma, advancing age, serous fluid accumulation in inflammatory eye pathology, and a complication after cataract surgery  . Direct observation of a detached retina can be impeded by a variety of factors, including an associated large vitreous hemorrhage, narrow anterior angle precluding mydriatic application, periorbital trauma, or lens opacification. In the aforementioned cases, and others, ocular ultrasonography can be used to delineate underlying pathology of visual symptoms. Because ocular emergencies represent 3% of all ED encounters, existing constraints to CT/MRI of the orbit including time and cost, and variable availability of ophthalmologists, emergency practitioner comfort with ocular ultrasound is important. To use B-scan for evaluation of retinal detachment cases in the emergency room, Teismann et al. recommend the mnemonic CASE. 2) Axial plane: apply the transducer gently on the eye with your fourth and fifth fingers resting on the patient’s nose. 3) Scan the retina for pathology. A normal appearing retina should be continuous. If detachment is present, fluid will begin to separate the retinal epithelium its attachment to the globe. This will create a thick, oscillating, hyperechoic structure in the case of retinal detachment. 4) Evaluate the entire eye: small retinal detachments can occur in the retina periphery. The patient may have to move his or her eyes while you are scanning to ensure visualization is complete. Other forms of eye pathology can appear similar on ultrasonography, including posterior vitreous detachment and vitreous hemorrhage. If retinal detachment is suspected based on imaging or clinical history, referral should be made to ophthalmology within 24 hours, as noted above . 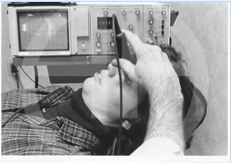 Research has shown that bedside ultrasound in the ED can be effectively used for the diagnosis of ocular pathology, as exemplified by Blaivas et al., 2002. In this study, 61 patients presenting with ocular trauma or acute visual changes within 48 hours of symptom onset underwent B-scanning. Patients with binocular symptoms indicative of neurologic pathology were excluded. Bedside ultrasound images were analyzed for presence of vitreous hemorrhage or detachment, retinal detachment, central retinal artery and vein occlusion (by Doppler ultrasound), globe rupture, intraocular foreign bodies, lens dislocation, and retrobulbar hematomas. Results were compared to a gold standard of CT of the orbit, ophthalmologist diagnoses, or both. In 60/61, nearly 100% of patients included in the study, the ED ultrasound results were confirmed by gold standard. As such, ocular ultrasound modalities are likely to serve as useful adjuncts in cases where ophthalmology consults are delayed. Of course, care should be taken to avoid vitreous fluid leakage in cases of penetrating eye injury, and caution should be exercised when applying ultrasound equipment to the eye. Choroidal nevi are benign lesions that are fairly common in the Caucasian population, ranging from 4.6-7.9%. Less common is a more concerning pathology, choroidal melanoma, which occurs in 6/1,000,000 of the same population. Imaging is essential for the delineation and measurement of the aforementioned lesions, as imaging characteristics are predictive of disease aggressiveness. For example, basal diameter and lesion thickness have been found correlated with metastasis and mortality of choroidal melanoma. It is important to follow growth of choroidal lesions by imaging, as rapid rate of growth is associated with eight times the risk of metastasis. Also, although the risk of a benign nevus transforming to melanoma is low, estimated to be 1/8,845, this rate increases with age to approximately 0.78% by 80 years old. Imaging is also important as when taken together with risk factors, lesion characteristics can help guide their treatment. If the lesion is not suspicious, it should be re-imaged every 6 months for a year, then annually for stability of the lesion. More frequent imaging is required with increased risk factors or high-risk features on imaging . One other important lesion to keep on the differential for a choroidal mass is choroidal osteoma, which typically is found in young healthy females. On ocular ultrasound, osteomas are highly reflective, acoustically dense masses with irregular elevation. Because of their high density, calcification and shadowing is typically seen on B-scan . American Academy of Ophthalmology. Neuro-Ophthalmology/Orbit: Ocular and orbital ultrasound Practicing Ophthalmologists Learning System, 2017 - 2019 San Francisco: American Academy of Ophthalmology, 2017. ↑ 3.0 3.1 3.2 3.3 Waldron, R.G. A-Scan Biometry. http://emedicine.medscape.com/article/1228447-overview. ↑ 4.00 4.01 4.02 4.03 4.04 4.05 4.06 4.07 4.08 4.09 4.10 Chopdar, A. & Aung, T. 2014. Multimodal retinal imaging. JP Medical Ltd.
↑ 5.0 5.1 5.2 5.3 Blaivas, M., Theodoro, D. Sierzenski, P.R. 2002. A study of bedside ocular ultrasonography in the emergency department. Acad Emerg Med 9(8): 791-799. ↑ 7.0 7.1 7.2 Teismann, N. Shah, S. & Nagdev, A. 2009. Focus on: Ultrasound for acute retinal detachment. American College of Emergency Physicians. ↑ D’Amico, D.J. 2008l Primary Retinal Detachment. NEJM. 359: 2346-2354. ↑ Cheung, A., Scott, I.U., Murray, T.G., & Shields, C.L. 2012. Distinguishing a choroidal nevus from a choroidal melanoma. Opthalmic Pearls: Oncology from Am Acad Ophthal 39-40. ↑ Bryan, R.N, Lewis, R.A., & Miller, S.L. 1983. ChoroidalOsteoma. AJNR 4: 491-494. This page was last modified on March 13, 2019, at 14:42. This page has been accessed 73,262 times.